On Monday, 128 flights were reported canceled, but the company did not detail why. Southwest Airlines has canceled dozens of flights over jet engine inspections after a midair explosion killed a passenger last week. The company said in a statement Sunday that the roughly 40 flights it had canceled accounted for about 1 percent of its 4,000 scheduled flights that day. The airline would not detail how many flights were canceled on Monday morning, but the travel-tracking website FlightAware showed that Southwest had canceled 128 flights, or 3 percent of its total, as if 10:30 a.m. ET on Monday. It was unclear how many of those cancellations were specifically because of engine inspections. "Since our operational plans entail multiple aircraft entering and exiting scheduled service during the ongoing inspection period, we are not able to provide real-time, continuous updates on total flight disruptions," Southwest said in a statement to NBC News on Monday. "Again, we are working directly with impacted customers on the minimal flight changes as we work diligently to ensure the safety of our fleet." A spokesman for FlightAware told NBC News that Southwest typically averages a few dozen cancellations on a normal day — making 128 above the average. There were no major weather events across the country on Monday morning apart from some heavy rains over the Southeast. The emergency inspections come after passenger Jennifer Riordan died aboard a flight last Tuesday when she was partially sucked out of the plane following an engine explosion that shattered a window. The flight from New York was forced to make an emergency landing in Philadelphia. 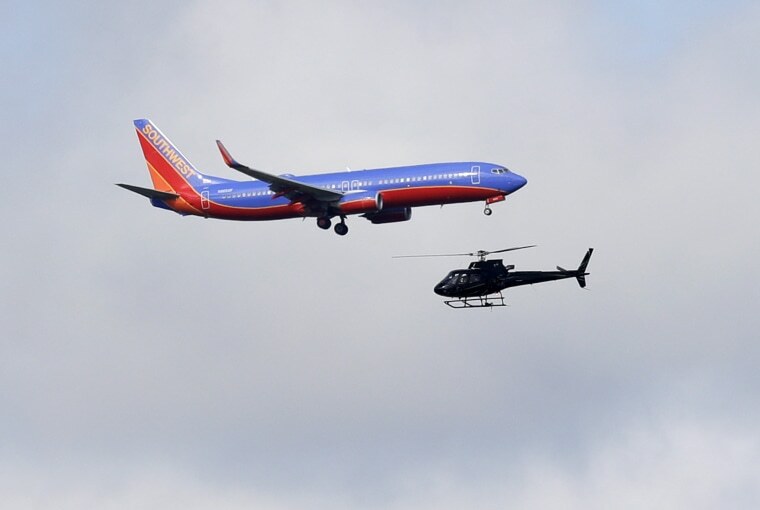 storylineSouthwest emergency: Did FAA wait too long on inspections? Southwest said after the accident that all of the CFM56-7B engines on its Boeing 737 fleet will be reviewed within 30 days. The company said the cancellations were not because of a Friday directive by the Federal Aviation Administration and European airline regulators ordering emergency inspections for fan blades on certain CFM56-7B engines within 20 days for all airlines. The “emergency airworthiness directive” affects 352 engines in the U.S. and 681 engines worldwide, according to the FAA. “The cancellations are a result of our voluntary, accelerated engine fan blade inspection program announced on Tuesday night,” the airline said.